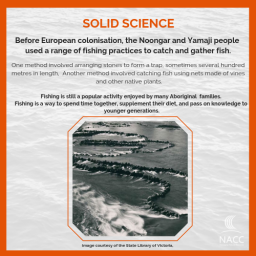 Aboriginal people around Australia cultivated the soil, planted root vegetables, propagated and spread seeds, and harvested, stored and traded seeds and grains. The Yamaji people ground seeds from plants such as kangaroo grass and acacia trees (as seen in the image) to make flour, which was then baked into damper or cakes. The Noongar people ground nuts from plants such as acacia seeds and the zamia palm to make flour, which was then baked into damper or cakes. These activities are still enjoyed today. 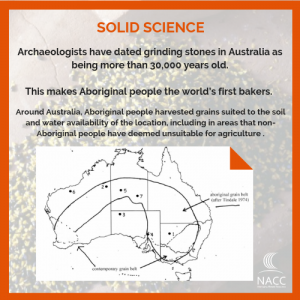 Archaeologists have dated grinding stones in Australia as being more than 30,000 years old. This makes Aboriginal people the world’s first bakers. On his travels, early European explorer George Grey recorded seeing fields of yams, several kilometres in length, with huts constructed nearby. Yams and other tubers were a reliable food source for the Yamaji people, who replanted smaller yams and roots for future harvests. 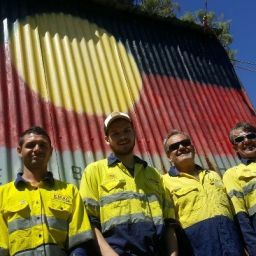 Around Australia, Aboriginal people harvested grains suited to the soil and water availability of the location, including in areas that non-Aboriginal people have deemed unsuitable for agriculture.